Trains.. they run in my family. Literally!! Many of my family has kept and still keeps trains going through out the United States! My beloved Pappa (Grandpa) was a train engineer and retired after over 30 years of service (supporting his family from the Depression Era until Retirement), my Dad and Uncle worked along side him when they were younger, even now my cousin Gary is a train man!! So when I created this cool, vintage and masculine card they came to mind and just in time for Father's Day! I love all things vintage - especially when it comes to trains! With it being a family business - memories of my waving to the trains and holding my Pappa's hand as we watched them... it's a dear to my heart memory. It also goes to show that men never grow too old - that with that child at heart feeling they still find joy in trains! Here, thanks to the Color Coach pairing the Smoky Slate and Basic Grey as monochromatic mates, I created a classic card that works for Father's Day, Masculine Birthdays and Bon-Voyage wishes! 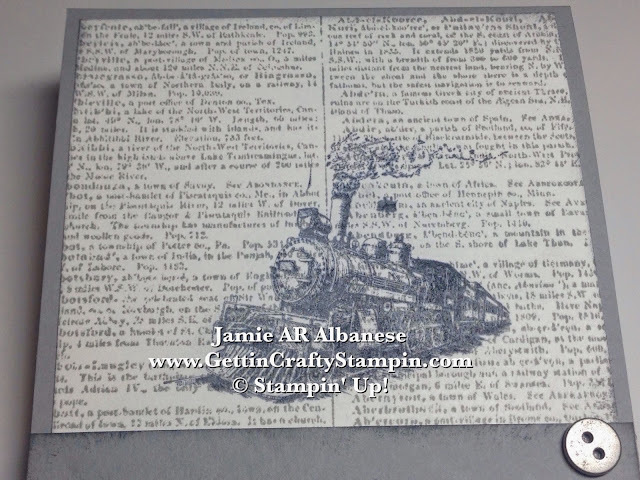 Stamp this Whisper White card stock (cut down to 5" x 3-3/4") with the Dictionary Background stamp in Smoky Slate ink. 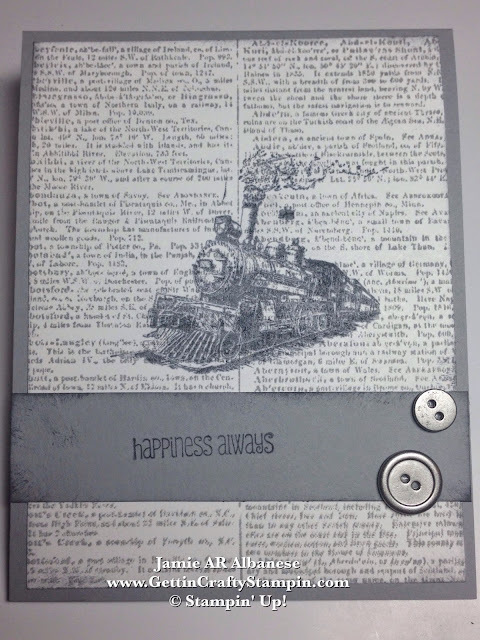 Stamp this classic train from the Traveler stamp set in Basic Grey ink over the lighter colored Dictionary print. My beloved Pappa and Daddy are in heaven. So this isn't a Father's Day card for me this year. It was a fun option at our recent card class and some did make this into a Father's Day card. Don't Miss OUT on my Fun Classes!! See the Upcoming Coffee & Cards on the 18th and MORE Classes when you CLICK HERE! With a cool stamp set like the new And Many More from the New Idea Book gives me 23 options on what I want to say!! Happiness Always works as an Anniversary Card for some friends of ours. Distress the White card stock and sentiment stamped Smoky Slate card stock with my Stamping Sponge dipped in the Basic Grey ink pad and rubbed along the edges of the pages. 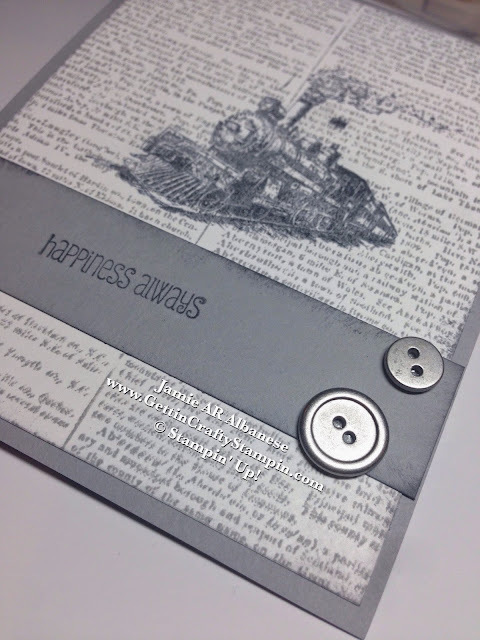 The Basic Metal Buttons adhere with Glue Dots and add a masculine look while continuing the vintage vibe of this card. No matter if you grew up with trains in the family, had a dad or brother who played with trains or just love them for yourself and your next generation.. this classic and cool card is a great way to say so much. Having fun in our card making classes is a great way to have me time while blessing others. Creating a masculine and vintage card is great for so many uses... I hope you have fun creating these, too!